A construction worker has been rescued after being trapped in a partially collapsed trench for five hours. The collapse rescue team freed the man from the muddy trench near the public works facility next to Greenbelt Lake in the 500 block of Crescent Road, Prince George's County Fire and EMS spokesman Mark Brady said. The worker has serious, non-life threatening injuries and has been taken to a trauma center, Brady said. Rescue crews were pumping oxygen and warm air into the trench and the worker received fluids from an IV. Brady said the man was also hooked up to an EKG so medics could monitor his heart activity during the rescue efforts. "He's in relatively good spirits considering the circumstances," Brady said in a video he posted to Twitter. 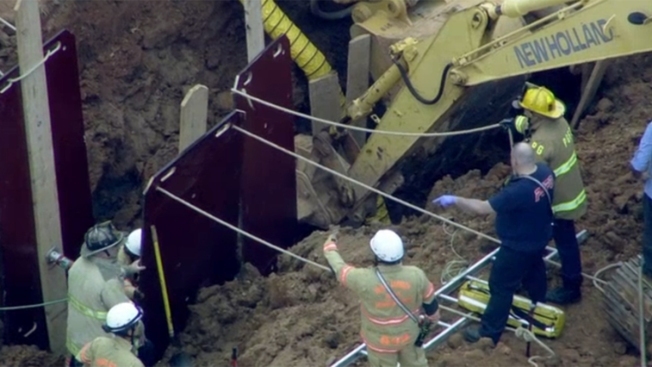 Howard County rescue workers assisted in the rescue effort, which began about 1 p.m.
Video from Chopper4 showed workers get the man onto a stretcher and pull him out of the trench about 6 p.m. The extent of the man's injuries is not known at this time.